Step outside on a winter’s day in Ulaanbaatar, the capital of Mongolia, and you’ll immediately notice two things. The first is the bitter cold: temperatures in January regularly reach −40 °C, making the city the coldest capital on the planet. The second is the thick, noxious smog that blankets the air, burning your throat and reducing visibility sometimes to mere metres. In fact, the city has some of the worst air quality in the world – even worse than notorious hotspots like Beijing and New Delhi. And the problem is growing worse every year. And, as our recent Green Economy Barometer for Mongolia shows, the country is rapidly urbanizing, with Ulaanbaatar almost tripling in population over the last twenty years. Most inhabitants rely on cheap local coal to stave off the freezing conditions, especially the large numbers who live in traditional Mongolian Gers. But what is it like to live in one of the most polluted cities in the world? How do people – both native Mongolians, and visitors to the city – cope with the toxic air that they live and work in every day? 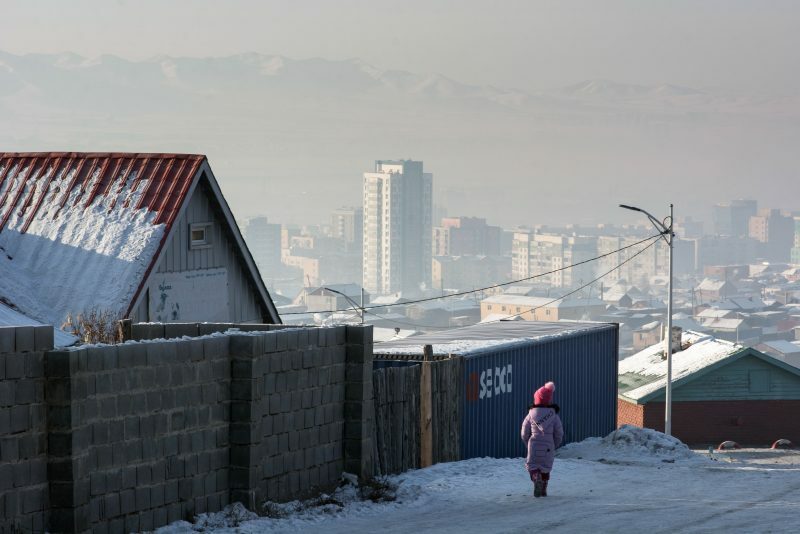 To answer that question, we’ve collected perspectives and stories from Ulaanbaatar’s residents, based on interviews, blogs and newspapers, talking about day to day life in the smog. We interviewed two kindergarten teachers at a school located in one of the most polluted districts in Ulaanbaatar city, teaching students between the ages of 3 to 5. We have kept their names anonymous to protect their privacy. “I‘ve been working as a kindergarten teacher for over 30 years, and I’ve noticed that our kids immune systems seem to be getting weaker and weaker every year. They get sick easily and most of them have started to show all types of allergies, from runny noses and itchy eyes to sore throats. Now some are even developing food allergies! Some of my kids can’t eat eggs, milk and apples. We do try to boost our kids’ immune systems, we give them fruits, hot sea buckthorn juice and curd drink in addition to their regular meals. And we try to make our kids physically as active as possible, but with the air pollution so bad you wonder if it’s enough. Speaking just for myself, I’ve experienced headaches, diarrhea and a burning sensation in my nose during the winter months, thanks to the air quality. I’ve bought an air pollution mask, but I don’t know how much difference it makes. “I’ve been teaching kindergarten kids for the last 5 years. Every year, the children in my class usually start to get sick from November, when the weather gets cold and the air gets dirty. During the winter, we make our children gargle and eat more fruit to try to counteract the pollution, but they still get sick. It’s hard to exaggerate how bad the air is in Ulaanbaatar. The closer you get to a ger district, the worse the air gets; in the ger districts themselves you can’t even see what is right in front of you. But I don’t wear any masks. Sometimes I feel like the parents don’t care enough about their kid’s health. They think that what they should do as parents is just to feed their kids and that’s it. Parents don’t talk to their kids and try to see their problems as important as that of adults. 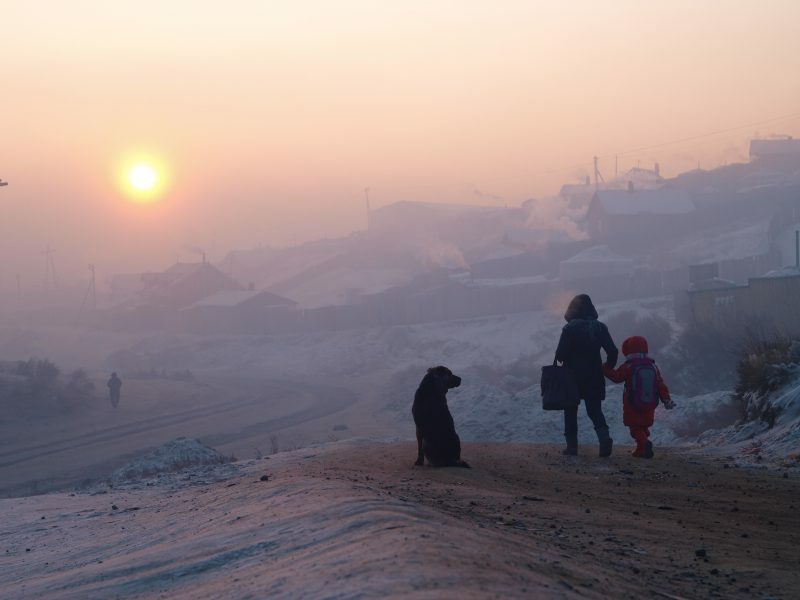 “Walking through Ulaanbaatar during the winter is sometimes like walking through a Hollywood depiction of a warzone. Smoke is everywhere. It doesn’t rise or leave, it just hovers in the air seeping into lungs, clothing, hair, and even under fingernails. The scent of the city never is entirely gone, even in the most ventilated apartments. As Americans, we lived in a country that owes our clean air to laws like the Clean Air Act of 1970. For almost 50 years, America has had clean air and the expectation is that we will continue to do so, but I don’t think most of us fully understand what these laws do to improve our way of life. I certainly didn’t. “On summer days, from my office window, I can see the beautiful snow-dappled mountains that surround Ulaanbataar; during the heavily polluted winter months the horizon is completely hidden behind a thick grey-brown smoky haze. Regardless of where you are from, visiting Ulaanbaatar during winter is a deeply unpleasant experience. The smell of smog, limited visibility during nights and days, and the choking air are all impossible to escape from. People who only stay in Mongolia for a short time might not truly experience the seriousness of the air pollution. But the real victims are all around. It’s tragic: mothers have to burn coal in their gers to survive, but then they lose their babies in their wombs due to all the carbon dioxide.